Yellow is the color of my true love's hair.... or in the case here, it is the color of spring. We have definitely jumped into spring early here. With record high temperatures this past week everything is starting to bloom. 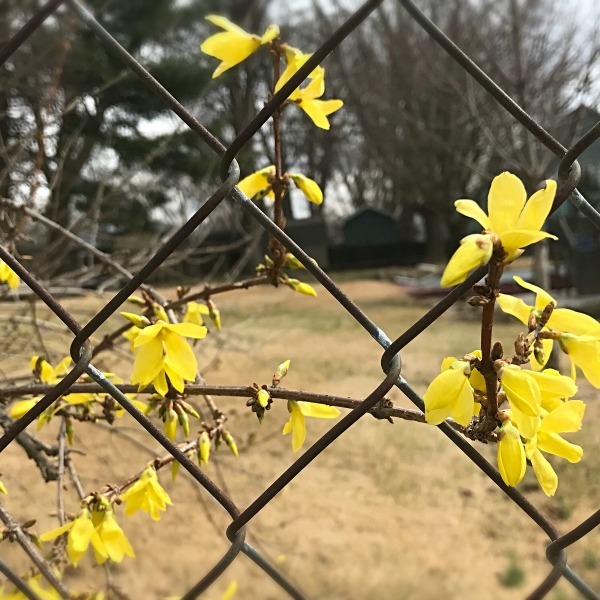 The forsythia is escaping its confines. 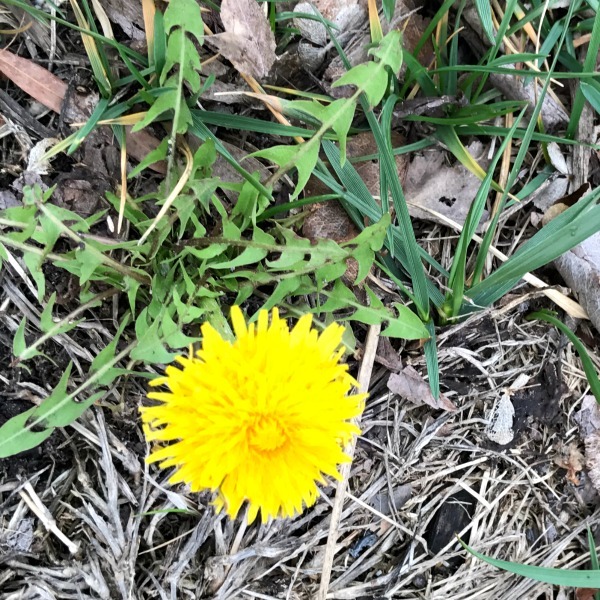 Even the dandelions are poking up their little heads. 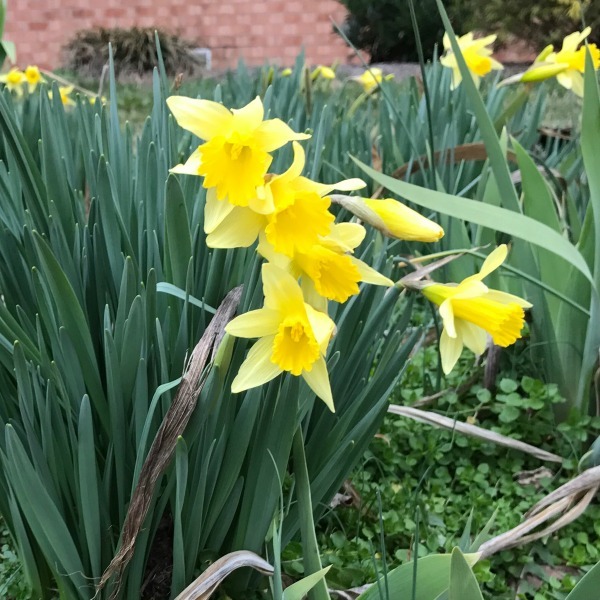 But my favorite sign of spring is the yellow daffodils. I know when I see them that we are starting to put winter behind us. Yesterday as I was out driving around I couldn't believe how much things had changed over a couple of days. Leaves are popping out on trees and bushes, and there are pink and white blossoms everywhere. I had hoped to get out and take some more photos today, but an evil wind blew in last night and today is forty degrees colder than yesterday. I think those photos will have to wait. Thank you for all of your kind words about my mom. She is gradually getting better. I can tell because she is grumpy. I had to give her a talking to this morning about the importance of taking a shower and getting herself going. I think it will make her feel better. I have one lone daffodil. Now it's turned cold again. I always loved cutting forsythia for a vase. Hope the nice weather holds! It was 81 here today so that's a little warm even for us! Hugs! Oh Laura to see Spring arriving in your area. Ahhhhh..... We still have some time to go before we see any new life. Enjoy all the yellow. So pretty. I hope you get some spring soon, Kris. It always helps get me out of the winter blahs. 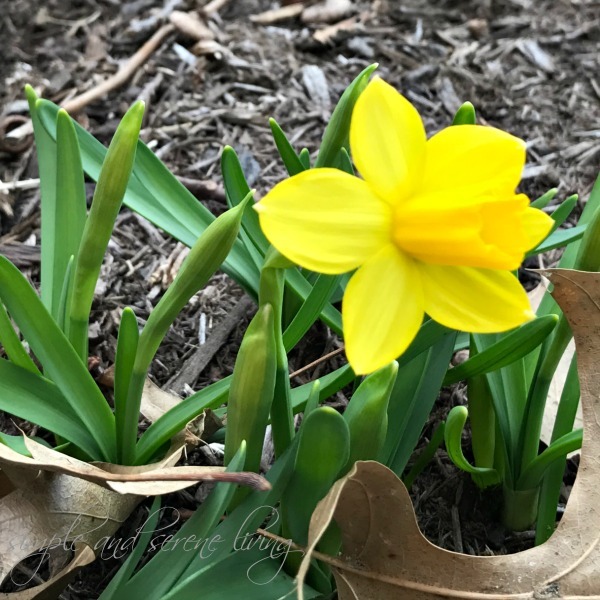 I can't believe how many bloggers are posting photos of spring flowers! Good afternoon Laura, the weather is a little crazy over here in England as well. Today is so warm and yet yesterday was sooo cold. I popped into the garden this morning to see how my spring bulbs were getting along. I have to tell you that my daffodils are not a patch on your beauties. I can only just see the tips of some green shoots. Maybe in another couple of weeks my daffodils will be a colourful as yours. I love the Donovan song you quoted. I can sing the words, but for the life of me I can't remember the title..... it will come to me eventually.